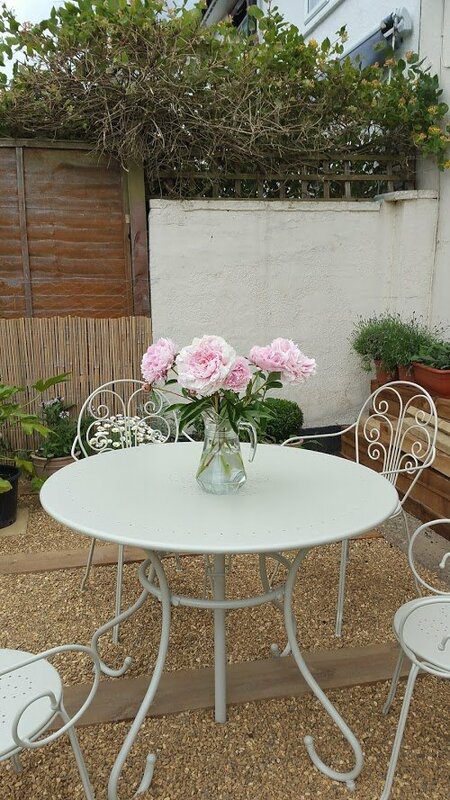 Welcome to part 6 of our garden make-over story. In part 5 I showed you how we planted our first bed and how we tackled our uneven garden. Our next project was building our patio. We decided that we would try to build our own patio to keep our costs down. 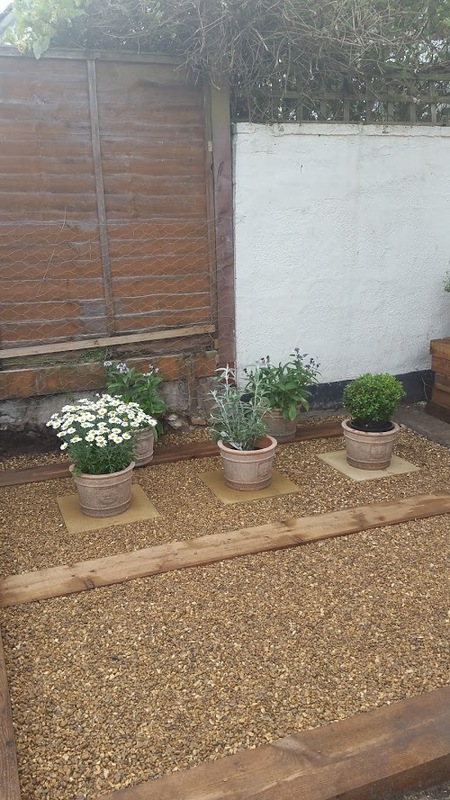 The easiest way was to continue the gravel path so that the gravel would then fill the patio area and contain it with wooden sleepers. We measured the space so that our sleepers would be exactly parallel and started lifting the grass to obtain a flat surface. Luckily this was one part of the garden that didn’t have a slope or bumps and we managed to get an even and flat surface. Once any remaining stones and the odd weed had been removed, we covered the ground with a horticultural membrane, or weed control fabric as it is also sometimes called. It is basically a woven, porous material that lets the rain water through but holds back any weeds. Well, that is the idea anyway. Do you need to lay a weed suppressing membrane? To tell you the truth, we later found that the weeds still come through. We did parts of the garden afterwards without the membrane, and guess what: we had less weeds coming through in those parts. I don’t know if this is because other parts of the garden had less weeds originally or whether this is just coincidence… it’s a mystery. I can only relate what happened in our case and what we personally experienced. Other gardeners may disagree but my own opinion is that you don’t necessarily need it. If you feel that you prefer to put the membrane down before using gravel, bark or any other landscape material, then I recommend that you use membrane securing pegs. You can easily obtain them online and they do make sure that the membrane doesn’t shift and that it stays in place. We divided the patio with wooden sleepers to contain the gravel better and laid three slabs in one of the sections. We have placed terracotta pots on these to make the area brighter. Later we also disguised the old wooden fence with a bamboo screen. We used 10mm pea gravel, or pea shingle, as it is easier to walk on than the bigger sized variety. There are many types of gravel, in different sizes and in different colours. As we were on a budget, we used the cheapest available but we also liked the look of the smaller one. It is also easy to replace as it is widely available in any garden centre or builders yard. I’ve heard some people say that they aren’t sure about a gravel patio because they worry the weeds will come through. This is something that you do need to consider when deciding to have a gravel patio. We do get the occasional weed coming through but so far it has been very low maintenance. I don’t like weeding either, but as a gardener, it’s one of those things that can’t be avoided. However, I would say that we get less weeds on the gravel than elsewhere in the garden. Excellent drainage. Other hard areas have to be built with an incline, to let water drain away. With gravel, water just soaks into the ground and there are no puddles! Comfortable to walk on. There is something very satisfying about the crunching sound when walking on gravel too, like walking on a British beach. And who wouldn’t like that? Affordable. 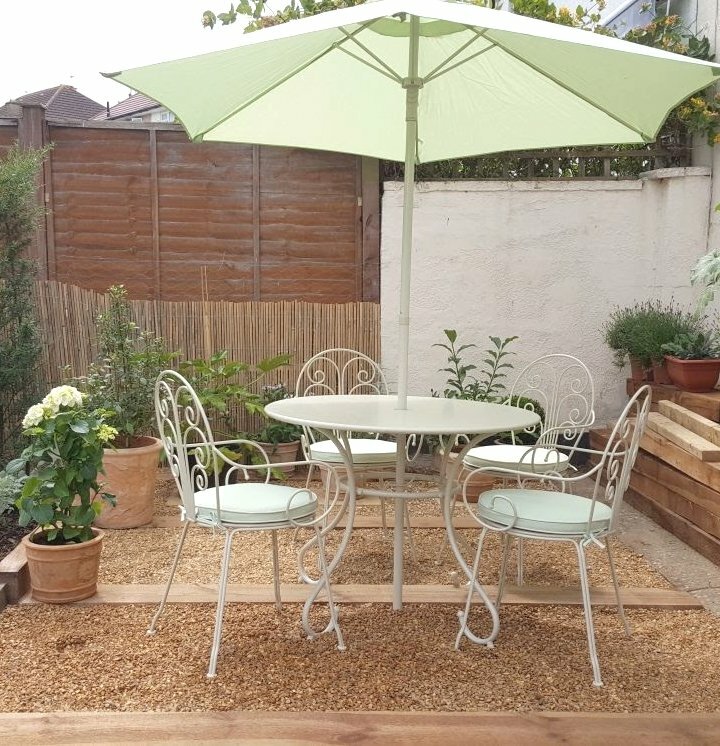 Pea shingle or gravel costs a fraction of materials when making a patio. We paid around £60 for a big bag that contained a ton in weight. Can be used by beginners. You don’t need to be a builder to lay a gravel patio. If we can do it, anybody can! It’s a very versatile and easy to use material. Suppresses weeds. As long as the layer of gravel is around 4 inches (10cm), weeds cannot grow through. However, we laid our gravel much thinner and the weeds only come through sparingly. Can be dragged along into other areas of the garden or into the house. Avoid this by containing the gravel. In our case we used wooden sleepers to divide areas and this works very well. Other edging could be stones, bricks or wooden log rolls. May need topping up in certain areas. However, raking it over now and again helps distribute it back into the right places. We haven’t had to top up our patio yet, but I can see that we may need to do so in future, especially on the paths. Not easy to clean. A solid surface can be brushed, swept or mopped. This is not possible with gravel but raking will take care of leaves and we have found that it stays looking good without much fuss. I personally love my gravel patio and gravel garden. I love the sound it makes and how it sets off the colours of the planting. Whether you have a solid surface patio or gravel, is very much a personal preference and the choice is yours. 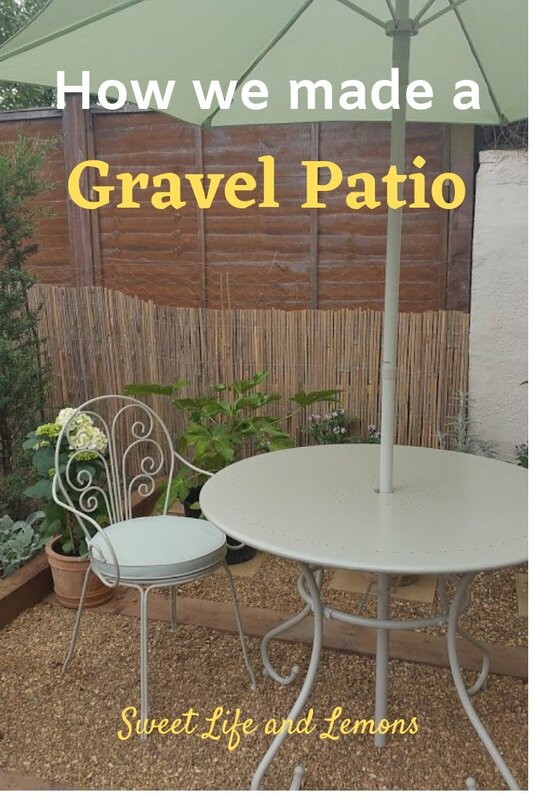 If you were wondering whether a gravel patio or gravel garden is for you, I hope this post has helped you make up your mind. If you have any questions that I might be able to answer, get in touch and leave a comment right here. Hope to see you at our next installment of how we made our garden!